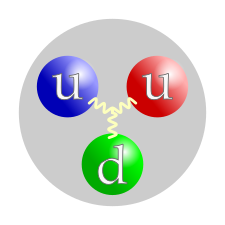 ^ Quark (subatomic particle). Encyclopædia Britannica. [2008-06-29]. ^ R. Nave. Confinement of Quarks. HyperPhysics. Georgia State University, Department of Physics and Astronomy. [2008-06-29]. ^ R. Nave. Bag Model of Quark Confinement. HyperPhysics. Georgia State University, Department of Physics and Astronomy. [2008-06-29]. ^ 4.0 4.1 R. Nave. Quarks. HyperPhysics. Georgia State University, Department of Physics and Astronomy. [2008-06-29]. ^ 5.0 5.1 5.2 5.3 B. Carithers, P. Grannis. Discovery of the Top Quark (PDF). Beam Line (SLAC). 1995, 25 (3): 4–16 [2008-09-23]. ^ C. Amsler et al. (Particle Data Group). Higgs Bosons: Theory and Searches (PDF). Physics Letters B. 2008, 667 (1): 1–1340. Bibcode:2008PhLB..667....1P. doi:10.1016/j.physletb.2008.07.018. ^ S.S.M. Wong. Introductory Nuclear Physics 2nd. Wiley Interscience. 1998: 30. ISBN 0-471-23973-9. ^ K.A. Peacock. The Quantum Revolution. Greenwood Publishing Group. 2008: 125. ISBN 031333448X. ^ B. Povh, C. Scholz, K. Rith, F. Zetsche. Particles and Nuclei. Springer. 2008: 98. ISBN 3540793674. ^ Section 6.1. in P.C.W. Davies. The Forces of Nature. Cambridge University Press. 1979. ISBN 052122523X. ^ 13.0 13.1 13.2 M. Munowitz. Knowing. Oxford University Press. 2005: 35. ISBN 0195167376. ^ 14.0 14.1 W.-M. Yao et al. (Particle Data Group). Review of Particle Physics: Pentaquark Update (PDF). Journal of Physics G. 2006, 33 (1): 1–1232. Bibcode:2006JPhG...33....1Y. arXiv:astro-ph/0601168. doi:10.1088/0954-3899/33/1/001. ^ C. Amsler et al. (Particle Data Group). Review of Particle Physics: Pentaquarks (PDF). Physics Letters B. 2008, 667 (1): 1–1340. Bibcode:2008PhLB..667....1P. doi:10.1016/j.physletb.2008.07.018. C. Amsler et al. (Particle Data Group). Review of Particle Physics: New Charmonium-Like States (PDF). Physics Letters B. 2008, 667 (1): 1–1340. Bibcode:2008PhLB..667....1P. doi:10.1016/j.physletb.2008.07.018. E.V. Shuryak. The QCD Vacuum, Hadrons and Superdense Matter. World Scientific. 2004: 59. ISBN 9812385746. ^ C. Amsler et al. (Particle Data Group). Review of Particle Physics: b′ (4th Generation) Quarks, Searches for (PDF). Physics Letters B. 2008, 667 (1): 1–1340. Bibcode:2008PhLB..667....1P. doi:10.1016/j.physletb.2008.07.018. C. Amsler et al. (Particle Data Group). Review of Particle Physics: t′ (4th Generation) Quarks, Searches for (PDF). Physics Letters B. 2008, 667 (1): 1–1340. Bibcode:2008PhLB..667....1P. doi:10.1016/j.physletb.2008.07.018. ^ D. Decamp. Determination of the number of light neutrino species. Physics Letters B. 1989, 231 (4): 519. Bibcode:1989PhLB..231..519D. doi:10.1016/0370-2693(89)90704-1. A. Fisher. Searching for the Beginning of Time: Cosmic Connection. Popular Science. 1991, 238 (4): 70. J.D. Barrow. The Singularity and Other Problems. The Origin of the Universe Reprint. Basic Books. 1997 . ISBN 978-0465053148. ^ D.H. Perkins. Particle Astrophysics. Oxford University Press. 2003: 4. ISBN 0198509529. ^ 19.0 19.1 M. Gell-Mann. A Schematic Model of Baryons and Mesons. Physics Letters. 1964, 8 (3): 214–215. Bibcode:1964PhL.....8..214G. doi:10.1016/S0031-9163(64)92001-3. ^ 20.0 20.1 G. Zweig. An SU(3) Model for Strong Interaction Symmetry and its Breaking (PDF). CERN Report No.8182/TH.401. 1964. （原始内容 (PDF)存档于2010-06-03）. ^ 21.0 21.1 G. Zweig. An SU(3) Model for Strong Interaction Symmetry and its Breaking: II. CERN Report No.8419/TH.412. 1964. ^ M. Gell-Mann. The Eightfold Way: A theory of strong interaction symmetry. (编) M. Gell-Manm, Y. Ne'emann. The Eightfold Way. Westview Press. 2000: 11 . ISBN 0-7382-0299-1. Original: M. Gell-Mann. The Eightfold Way: A theory of strong interaction symmetry. Synchroton Laboratory Report CTSL-20 (California Institute of Technology). 1961. ^ Y. Ne'emann. Derivation of strong interactions from gauge invariance. (编) M. Gell-Manm, Y. Ne'emann. The Eightfold Way. Westview Press. 2000 . ISBN 0-7382-0299-1. Original Y. Ne'emann. Derivation of strong interactions from gauge invariance. Nuclear Physics. 1961, 26: 222. Bibcode:1961NucPh..26..222N. doi:10.1016/0029-5582(61)90134-1. ^ R.C. Olby; G.N. Cantor. Companion to the History of Modern Science. Taylor & Francis. 1996: 673. ISBN 0-415-14578-3. ^ A. Pickering. Constructing Quarks. University of Chicago Press. 1984: 114–125. ISBN 0226667995. ^ B.J. Bjorken, S.L. Glashow. Elementary Particles and SU(4). Physics Letters. 1964, 11 (3): 255–257. Bibcode:1964PhL....11..255B. doi:10.1016/0031-9163(64)90433-0. ^ J.I. Friedman. The Road to the Nobel Prize. Hue University. [2017-06-13]. ^ R.P. Feynman. Very High-Energy Collisions of Hadrons. Physical Review Letters. 1969, 23 (24): 1415–1417. Bibcode:1969PhRvL..23.1415F. doi:10.1103/PhysRevLett.23.1415. ^ 30.0 30.1 30.2 30.3 D.J. Griffiths. Introduction to Elementary Particles. John Wiley & Sons. 1987. ISBN 0-471-60386-4. ^ 31.0 31.1 31.2 M.E. Peskin, D.V. Schroeder. An introduction to quantum field theory. Addison–Wesley. 1995. ISBN 0-201-50397-2. ^ V.V. Ezhela. Particle physics. Springer. 1996: 2. ISBN 1563966425. ^ S.L. Glashow, J. Iliopoulos, L. Maiani. Weak Interactions with Lepton–Hadron Symmetry. Physical Review D. 1970, 2 (7): 1285–1292. Bibcode:1970PhRvD...2.1285G. doi:10.1103/PhysRevD.2.1285. ^ M. Kobayashi, T. Maskawa. CP-Violation in the Renormalizable Theory of Weak Interaction (PDF). Progress of Theoretical Physics. 1973, 49 (2): 652–657. Bibcode:1973PThPh..49..652K. doi:10.1143/PTP.49.652. ^ 35.0 35.1 H. Harari. A new quark model for hadrons. Physics Letters B. 1975, 57B: 265. Bibcode:1975PhLB...57..265H. doi:10.1016/0370-2693(75)90072-6. ^ 36.0 36.1 36.2 K.W. Staley. The Evidence for the Top Quark. Cambridge University Press. 2004. ISBN 9780521827102. ^ M. Bartusiak. A Positron named Priscilla. National Academies Press. 1994: 245. ISBN 0309048931. ^ F. Abe et al. (CDF Collaboration). Observation of Top Quark Production in pp Collisions with the Collider Detector at Fermilab. Physical Review Letters. 1995, 74: 2626–2631. Bibcode:1995PhRvL..74.2626A. PMID 10057978. doi:10.1103/PhysRevLett.74.2626. ^ S. Abachi et al. (DØ Collaboration). Search for High Mass Top Quark Production in pp Collisions at √s = 1.8 TeV. Physical Review Letters. 1995, 74: 2422–2426. Bibcode:1995PhRvL..74.2422A. doi:10.1103/PhysRevLett.74.2422. ^ New Precision Measurement of Top Quark Mass. Brookhaven National Laboratory News. [2008-09-24]. ^ J. Gribbin, M. Gribbin. Richard Feynman: A Life in Science. Penguin Books. 1997: 194. ISBN 0-452-27631-4. ^ J. Joyce. Finnegans Wake. Penguin Books. 1982: 383 . ISBN 0-14-00-6286-6. LCCN 59-354. ^ M. Gell-Mann. The Quark and the Jaguar: Adventures in the Simple and the Complex. Henry Holt and Co. 1995: 180. ISBN 978-0805072532. ^ J. Gleick. Genius: Richard Feynman and modern physics. Little Brown and Company. 1992: 390. ISBN 0-316-903167. ^ J.J. Sakurai. S.F Tuan, 编. Modern Quantum Mechanics Revised. Addison–Wesley. 1994: 376. ISBN 0-201-53929-2. ^ 47.0 47.1 D.H. Perkins. Introduction to high energy physics. Cambridge University Press. 2000: 8. ISBN 0521621968. ^ M. Riordan. The Hunting of the Quark: A True Story of Modern Physics. Simon & Schuster. 1987: 210. ISBN 9780671504663. ^ 49.0 49.1 F. Close. The New Cosmic Onion. CRC Press. 2006. ISBN 1584887982. ^ G. Fraser. The New Physics for the Twenty-First Century. Cambridge University Press. 2006: 91. ISBN 0521816009. ^ D. Lincoln. Understanding the Universe. World Scientific. 2004: 116. ISBN 9812387056. ^ Z. Maki, M. Nakagawa, S. Sakata. Remarks on the Unified Model of Elementary Particles (PDF). Progress of Theoretical Physics. 1962, 28 (5): 870. Bibcode:1962PThPh..28..870M. doi:10.1143/PTP.28.870. −2 °. European Physical Journal. 2007, C50 (3): 573–578. Bibcode:2007EPJC...50..573C. arXiv:hep-ph/0605032. doi:10.1140/epjc/s10052-007-0212-z. ^ R. Nave. The Color Force. HyperPhysics. Georgia State University, Department of Physics and Astronomy. [2009-04-26]. ^ B.A. Schumm. Deep Down Things. Johns Hopkins University Press. 2004: 131–132. ISBN 080187971X. OCLC 55229065. ^ V. Icke. The force of symmetry. Cambridge University Press. 1995: 216. ISBN 052145591X. ^ M.Y. Han. A story of light. World Scientific. 2004: 78. ISBN 9812560343. ^ C. Sutton. Quantum chromodynamics (physics). Encyclopædia Britannica Online. [2009-05-12]. ^ A. Watson. The Quantum Quark. Cambridge University Press. 2004: 285–286. ISBN 0521829070. ^ 61.0 61.1 61.2 K. Nakamura et al. (Particle Data Group). Review of Particle Physics: Quarks (PDF). Journal of Physics G. 2010, 37: 075021. Bibcode:2010JPhG...37g5021N. doi:10.1088/0954-3899/37/7A/075021. ^ W. Weise, A.M. Green. Quarks and Nuclei. World Scientific. 1984: 65–66. ISBN 9971966611. ^ D. McMahon. Quantum Field Theory Demystified. McGraw–Hill. 2008: 17. ISBN 0071543821. ^ S.G. Roth. Precision electroweak physics at electron–positron colliders. Springer. 2007: VI. ISBN 3540351647. ^ R.P. Feynman. QED: The Strange Theory of Light and Matter 1st. Princeton University Press. 1985: 136–137. ISBN 0-691-08388-6. ^ 66.0 66.1 M. Veltman. Facts and Mysteries in Elementary Particle Physics. World Scientific. 2003. ISBN 981238149X. ^ 67.0 67.1 F. Wilczek, B. Devine. Fantastic Realities. World Scientific. 2006. ISBN 981256649X. ^ T. Yulsman. Origin. CRC Press. 2002: 55. ISBN 075030765X. ^ F. Garberson. Top Quark Mass and Cross Section Results from the Tevatron. 2008. arXiv:0808.0273 [hep-ex]. ^ J. Steinberger. Learning about Particles. Springer. 2005: 130. ISBN 3540213295. ^ C.-Y. Wong. Introduction to High-energy Heavy-ion Collisions. World Scientific. 1994: 149. ISBN 9810202636. ^ 72.0 72.1 72.2 S.B. Rüester, V. Werth, M. Buballa, I.A. Shovkovy, D.H. Rischke. The phase diagram of neutral quark matter: Self-consistent treatment of quark masses. Physical Review D. 2005, 72: 034003. Bibcode:2005PhRvD..72c4004R. arXiv:hep-ph/0503184. doi:10.1103/PhysRevD.72.034004. ^ 73.0 73.1 73.2 M.G. Alford, K. Rajagopal, T. Schaefer, A. Schmitt. Color superconductivity in dense quark matter. Reviews of Modern Physics. 2008, 80: 1455–1515. Bibcode:2008RvMP...80.1455A. arXiv:0709.4635. doi:10.1103/RevModPhys.80.1455. ^ S. Mrowczynski. Quark–Gluon Plasma. Acta Physica Polonica B. 1998, 29: 3711. Bibcode:1998AcPPB..29.3711M. arXiv:nucl-th/9905005. ^ Z. Fodor, S.D. Katz. Critical point of QCD at finite T and μ, lattice results for physical quark masses. Journal of High Energy Physics. 2004, 2004: 50. Bibcode:2004JHEP...04..050F. arXiv:hep-lat/0402006. doi:10.1088/1126-6708/2004/04/050. ^ RHIC Scientists Serve Up "Perfect" Liquid. Brookhaven National Laboratory News. 2005 [2009-05-22]. （原始内容存档于2013-04-15）. ^ T. Yulsman. Origins: The Quest for Our Cosmic Roots. CRC Press. 2002: 75. ISBN 075030765X. ^ A. Sedrakian, J.W. Clark, M.G. Alford. Pairing in fermionic systems. World Scientific. 2007: 2–3. ISBN 9812569073.